I hope you all enjoyed my try-on session last Thursday of all the items I purchased during Early Access! I actually purchased more things a few days after my original order, so I received those boxes on Friday. While there isn’t as much to try on, I still thought it would be worth doing another quick try-on session over on SnapChat today! Tune in around 12pm CST to see the other things I ordered and what I plan to keep. My absolute favorite Nordstrom Anniversary Sale purchase so far is this super soft, luxe cashmere cardigan! 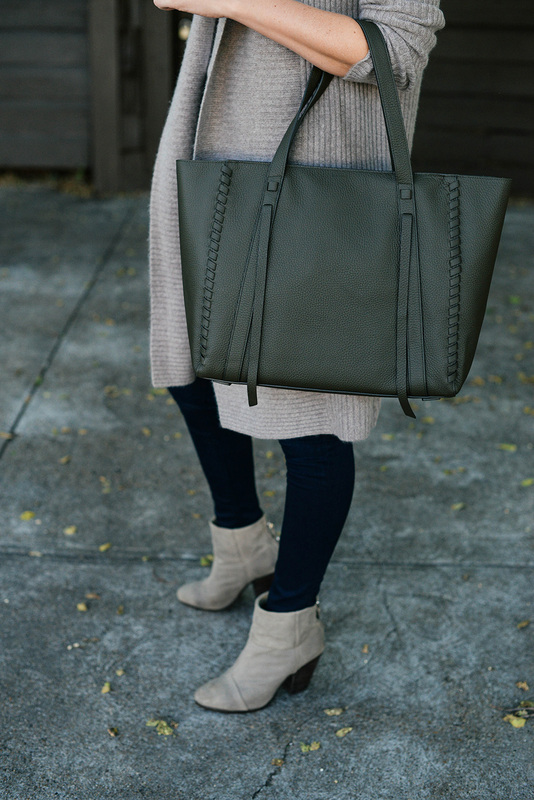 The oatmeal hue is the perfect transitional neutral for my wardrobe and it really is the softest thing ever! It’s also not bulky at all, which is something I often find in cardigan styles. Another thing I love about this cardigan is just how wearable it is! Pair it with leggings and a tee for travel/errands/lounging, with jeans and booties on the weekend, and over a blouse and trousers at work. While it’s still somewhat of an investment at $199, the price will jump to $299 once the sale is over! Definitely worth grabbing while it’s marked down. A couple other lust-worthy items I snagged include this leather tote and these high-rise skinny jeans in the perfect dark blue hue for fall/winter. 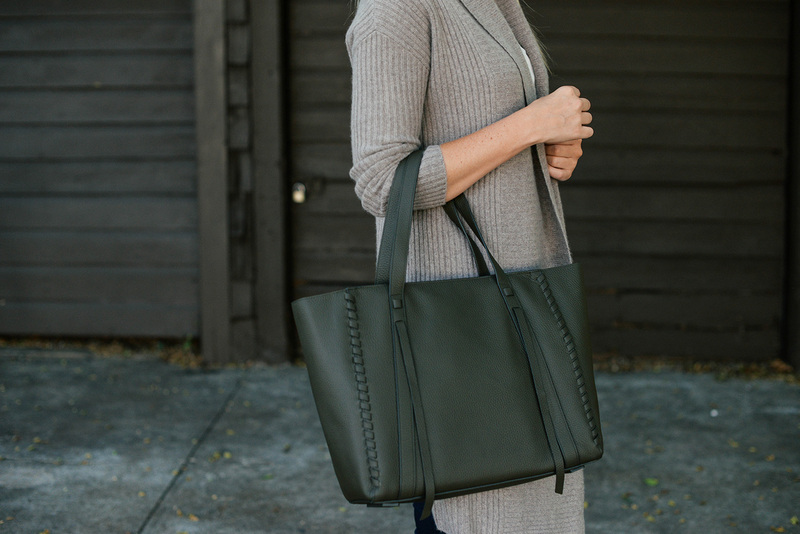 While the stylish details on this tote are initially what drew me to it, it’s the color and pebbled leather that made it worth keeping! 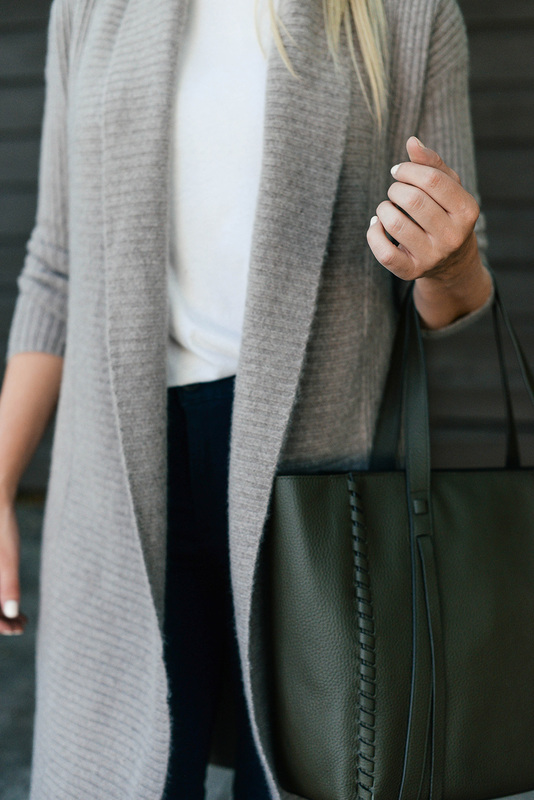 I’m always looking for versatile neutral bags, and this deep green color will be a nice alternative to black this season. I also try to avoid smooth leather bags if possible, because they can scratch easily. The pebbled leather makes it a tougher piece that will stand the test of time, wear and travel. It also comes in a pretty mushroom grey color! What I love about these jeans is they are actually already the style I wear on the reg (I own the same pair in black! ), but just in a new color option for the coming season. As always, keep an eye on THE SHOP where I’m updating and adding my new sale favorites in real time. I’ve also updated the Style Staples and Pre-Fall Favorites tabs with a bunch of amazing new finds – don’t miss it! Stay tuned for more of my favorite Anniversary Sale purchases! 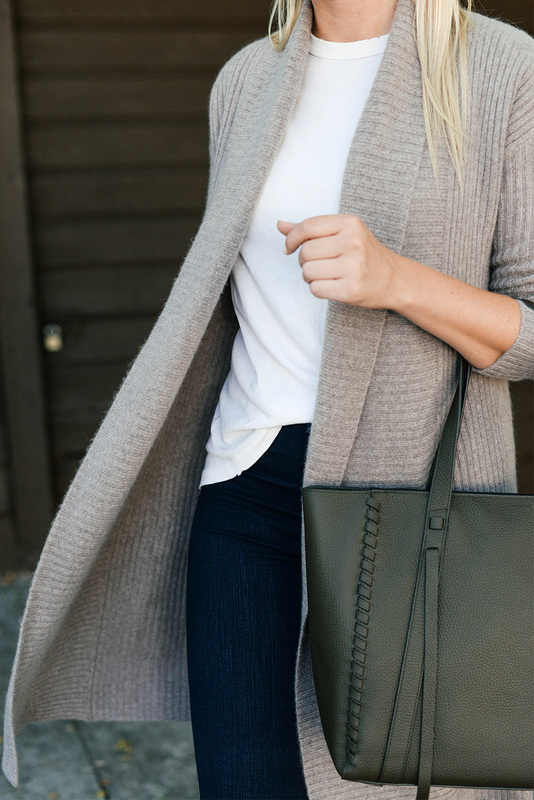 That cardigan is such a great buy! So perfect for Fall! So classic! Happy Monday, lady! What size did you get in the cardigan? Thanks!